To non-believers, to celebrate the feast of the Cross makes no sense at all. It is sheer lunacy. To those who don’t believe, it is a symbol of death, shame, and defeat. There is nothing glorious about the cross and the one who hangs on it. There is only shame. Shame stripped away every earthly support that the Lord had: His friends gave way in shaming abandonment; His reputation gave way in shaming mockery; His decency gave way in shaming nakedness; His comfort gave way in shaming torture. His glorious dignity gave way to the utterly undignified, degrading reflexes of moaning and groaning. But for us Christians, the Cross is the greatest summary of our faith. St. Francis of Assisi used to call it his “book,” where he learned all of his wisdom. The Cross is also the key that opens the doors of heaven. St. Rose of Lima, the first saint of the Americas, said, “Apart from the Cross, there is no other ladder by which we may get to heaven.” If we wish to get to eternal life with God, we must climb up with Jesus by means of the Cross. Yes, the Cross of our Lord and Saviour Jesus Christ is a sign of contradiction to the values and principles of the world. The Cross summons us to change the way we see things. It shows how God can bring good out of evil, order out of chaos, meaning out of absurdity, and life out of death. It urges us, challenges us, and demands us to look at the world in a vision and in a way that departs from the vision we might have under a secular perspective. It calls us to look at our relationships with others, to look at life, and to see death in ways that are inside-out and upside-down from those who have no faith, and those who are forced to see them through the eyes of fear. Pre-eminently, the Cross is proof of how far it is that God our Father has gone to prove His love for you and me. Strangely and in a seemingly contradictory way, the Cross is a sign of Love. No! It is not merely a sign or a symbol, it is the ultimate proof of God's love for us. Death, under the Cross, is not an ending, it is a beginning. Suffering, pain and loss under the Cross, are no longer things that separate us from God, rather they unite us to Him. Tragedy under the cross is not ultimate, it is only temporary. Sin under the cross no longer alienates us from God, it occasions His coming to us in the midst of our sins in His merciful love. The humiliation the Church and her ministers must endure today, would not be a sign of her destruction, but rather of her purification. What does it mean for the Church to walk in the path of our Lord? If the Church truly continues the ministry of Christ in the world, then she must embrace the Cross. And this ultimately leads to rejection, humiliation and even persecution. The Third Millennium has been called by many names, but perhaps one of the most apt descriptions of this new millennium is that it would be called the Age of Martyrdom. For indeed, we have seen the martyrdom of more Christians than in any of the previous centuries. The painful irony is that the persecution of thousands and millions of Christians who have to live and survive under the shadow of the cross are now overshadowed by the spectre of a new global wave of clerical abuse and cover-ups. These abuse scandals are doubly scandalous because they come at a time when the Church is entering a new era of persecution. Although the scandals certainly demand our attention, they also serve to draw attention away from the plight of persecuted Christians. Unfortunately, the story of immoral clerics and cowardly bishop is far more juicy than the plight and sufferings of persecuted Christians who continue to labour under the crushing weight of the cross. It is sad to see Christians discouraged by the sins of other Catholics, and, yet, it seems that the greatest suffering of the Church comes from the wounds of her members. The Catechism quotes on this point a pope who personally embraced the suffering of the Church in himself: “The Church is therefore holy, though having sinners in her midst, because she herself has no other life but the life of grace. If they live her life, her members are sanctified; if they move away from her life, they fall into sins and disorders that prevent the radiation of her sanctity. This is why she suffers and does penance for those offenses, of which she has the power to free her children through the blood of Christ and the gift of the Holy Spirit” (Pope Bl. Paul VI, Credo of the People of God, § 19). If the Church is called by God to sanctify the modern world, how else would this happen but on the Cross? The Church’s path is the path of the Lord: Calvary. Every time when I am beset by anxiety and troubles, every time I feel the weight of my responsibilities, every time when I am overwhelmed by shame and failure and tempted to give up, I look at the Cross, it gives me courage and hope, more than anything else the world can offer. When I look at Our Lord hanging on the Cross, my heart is filled with all that is beautiful, even in the midst of the world’s ugliness, all that is bright, even in the midst of the world’s darkness and I’m reminded once again, that death will not have the last word, suffering and failure will not strike the last chord, darkness will not mark the end of the story, sin will not hammer the last nail, but it would be life. Love will have the last word. “For God loved the world so much that He gave His only Son, so that everyone who believes in Him may not be lost.” More than ever before, today’s feast invites all Catholics, scandalised by the horrors of the clergy sexual abuse and the divisions within the Church, to look at the Cross. We are, indeed, in the throes of an agonising trial, a trial which is the test of our Hope and of our Faith in the Church: the test of our Hope and our Faith in the Cross. So let us regain our courage, and as that great medieval spiritual work tells us: “We have begun: we may not go back, nor may we leave off. Take courage brethren: let us go forward together. Jesus will be with us. 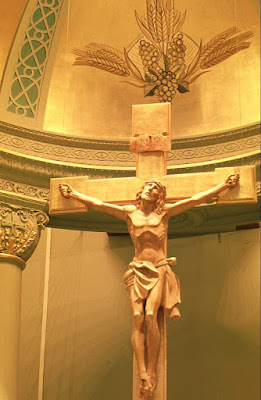 For the sake of Jesus, we have taken up this Cross; for Jesus’ sake, let us persevere in it. He will be our Helper, Who is our Captain and our Forerunner. Behold our King marches before us, Who will fight for us. Let us follow Him manfully, let no one fear terrors, let us be ready to die valiantly in battle; nor let us bring disgrace upon our glory by flying from the Cross!” (The Imitation of Christ, Book III, Chap. LVI) Then, the Cross will shine once again, not as a symbol of our shame, but the Triumph of Christ over evil and darkness.